1. Preheat the oven to 200°C, gas mark 6 and brush 2 large baking sheets with a little melted butter. Finely chop the prawns, pak choi and salad onion. Put in a bowl with half the ginger paste, the oyster sauce, oil and salt. Mix together. 2. Place one sheet of filo on a lightly floured surface. Top with 2 more sheets, brushing with butter between each one. Cut the stack in half lengthways, then across 3 times, to make 8 squares about 11-12cm in size. Repeat with the remaining 3 sheets to give 16 triple-layered squares in total. 3. Place 1 tablespoon of mixture into the centre of each square. Brush the edges with butter, then fold in each corner, slightly overlapping, to form an envelope. 4. Place onto the baking sheet and cook for 8-10 minutes until golden and piping hot throughout. Meanwhile, mix the chilli sauce with the remaining ginger paste, lime juice and soy sauce. 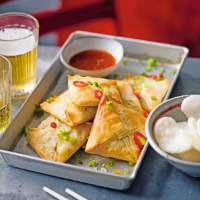 Serve the hot parcels scattered with chilli and salad onion, with the crackers and chilli sauce on the side.